A truly world-class airport by all standards, Dallas Fort Worth International Airport (DFW) is just 15 miles / 24 km northwest of downtown Dallas and around 18 miles / 29 km northeast of Fort Worth. This famous international airport is also close to both North Lake Park and Silver Lake Park, and has grown to become a leading hub for the world's busiest airline, American Airlines, which alone flies to over 160 destinations. In total, DFW is currently handling just over 60 million passengers in a single year and ranks as the world's number six busiest airport. A choice of ground transportation is offered at Dallas Fort Worth Airport. There is a train service operating at DFW, providing easy access between terminals, to all parking areas and to the neighboring hotels. Airport transport options include more than 50 different charter bus services, shared-ride vans, courtesy cars, taxis and American Airlines trains (the DFW TrAAin service). Taxis are readily available outside the airport and run to both central Dallas and to central Fort Worth, along with the Fort Worth Convention Center, Arlington City Hall and the city of Irving. Also nearby are the cities and towns of Carrollton, Garland, Grand Prairie, McKinney, Mesquite and Richardson. 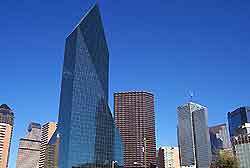 Situated in the state of Texas, where it has grown to become the third-biggest city, Dallas is famous for many reasons, such as being the place where President JF Kennedy was shot, and also the setting for the popular television soap opera 'Dallas'. A number of its most visited attractions relate to these parts of its history - the Sixth Floor Museum at Dealey Plaza and the adjacent John F. Kennedy Memorial, and also the Southfork Ranch, home of the much-loved Ewing family. Dallas Fort Worth Airport (DFW) is close to a number of large suburban areas, namely Bedford, Colleyville, Coppell, Euless, Grapevine and Southlake. Both Irving and Arlington are also close to the airport, although most passengers head to Dallas to soak up the atmosphere and enjoy the main sightseeing opportunities. Look out for the American Airlines Center entertainment complex, the Dallas World Aquarium, the huge Bank of America Tower, and Fair Park, where the Texas Centennial Expo was held in 1936.